If your school has lost someone to suicide, After a Suicide: A Toolkit for Schools offers best practices and practical tools to help school administers in the aftermath of a suicide. 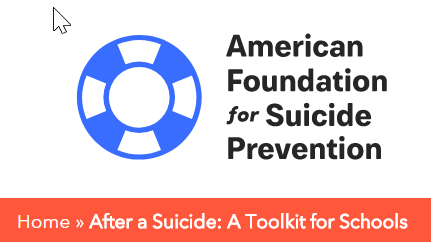 In collaboration with the Suicide Prevention Resource Center, AFSP offers After a Suicide: A Toolkit for Schools to help schools in the aftermath of a suicide or other death. A practical resource to schools facing real-time crises in diverse populations and communities, resources found in the Toolkit include managing crisis response, helping students cope, working with the community, memorialization, social media, suicide contagion, and engaging external resources for support. Follow the link below to download the toolkit.